Coupon Description: MoreBeer.com currently has a coupon code for Beer Smith 2 Home Brewing Software for $18.99. The BeerSmith 2 home beer brewing software is perfect for the beginning home brewers and advanced brewers. It features tools for extract, partial mash and all grain brewers. Incredibly easy to use with unlimited undo, simple web-like navigation, a preview pane and a no-nag interface. Includes over dozen standalone tools in addition to recipe analysis that is fully integrated with the recipe system. Equipment databases let you set up your equipment once and use it multiple times. Create a shopping list directly from any recipe. Mash profiles for the advanced brewer make changing your mash schedule a snap. BeerSmith will even build a step-by-step list of instructions directly from your recipe. If you are not using this home brewing software, you should be! Coupon Description: Right now there is a deal where you can get a $55 Stainless Steel Homebrewing Pump Head Upgrade. Chugger is the first pump made specifically by brewers for brewers. These pump heads are comparable to the popular March pumps in virtually every way except of course for the stainless steel. Chugger heads are interchangeable with existing March brand pump motors. That means that you can upgrade your existing March 809 motor with one of these stainless steel heads in less than 5 minutes and stop dealing with leaky stripped out threads. These stainless steel home brewing pump heads can handle liquids of 250 F and the materials that they are manufactured with are FDA Food Compliant and components are UL Recognized. With this home brewing stainless steel pump upgrade, changing you existing march pump over to stainless steel is a snap. Adventures in Homebrewing Promo Code - Save Up To 20% On Blichmann Homebrewing Equipment! Coupon Description: MoreBeer.com currently has a coupon code for a $36 Home Brewing Water Filter Kit. Great beer starts with great water. The last thing that you want to do is pass pollutants, chlorine or organic mater into your beer that will create off flavors! This home brewing water filter kit features a carbon block filter that removes all chlorine and organic flavors from your homebrew water. This homebrewing water filtering kit includes a housing, carbon block filter, garden hose attachment, barbed fittings and 6′ of 3/8″ vinyl tubing. Coupon Item Description: Adventures in Homebrewing currently has a sale on a $69 New 5 Gallon Keg. Why worry about bad seals, scratched surfaces and dents when you can get a brand new 5 gallon home brewing keg for the same price as a used one? For a limited time, Adventures in Homebrewing has these brand new 5 gallon homebrew kegs for just $69.99, so stock up while prices are low! 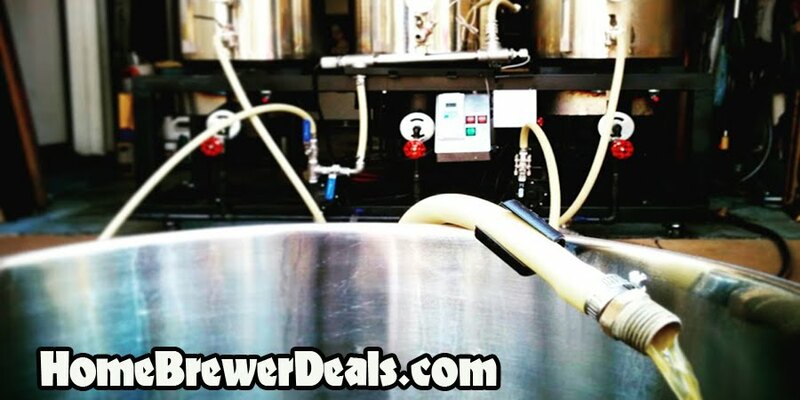 Coupon Description: MoreBeer.com currently has a coupon code for a $1,349 for a Braumeister Home Brewing System. The Braumeister is a complete electric all-grain brewing system that ships free of charge from MoreBeer! The braumeister home brewing system is made by Speidel of Germany. These systems are imported and supported in USA by MoreBeer! The Braumeister homebrew system features an automation and ease of use that is unparalleled in brewing all-grain beer at home. Plus we love the quality of beer produced on these machines. This automated homebrewing system is small in footprint and powered by electricity allowing you to brew inside, in a confined space, without the fear of carbon monoxide gas from a flame source. Secondly this unit is very easy to use as you mash the grain and then boil the wort in the same vessel. We also love the automation and control. Before you brew you set the controller with the different temperatures you wish to attain (advice is given on what to set) and the built in heating element and pump do the rest.